I have been able to get some shots early morning and late afternoon. My inside shots usually have a glare spot. Can any tell me where to learn more about this. Here are some tips that may assist you with obtaining your desire results. The iPad's screen doesn't view well outside, especially not in the direct sunlight. The glossy screen and smudges combine to make a mess in sunny situations. The screen darkens because the iPad's ambient light sensor is activated. I believe if you cover the sensor then the screen won't auto darken. But you can turn the auto brightness off in the Settings app (Brightness and Wallpaper) You can double click the home button and push the icons to the right a couple of times to reveal the brightness slider. You may be able to adjust it so that the screen is not so dark as well. If the subject matter of your pictures are non-human, then you might want to throw a towel over your head and iPad to reduce glare. Don't try this with humans because they would laugh at you; roses won't. Finally, you may want to use VideoPix for IPad to extract your subjects from videos captured on the IPad 2. The iPad 2 takes better video than it does pictures, so why not take a video instead of photos? VideoPix lets you grab photos from any video that is on your device. You could video record your subject from all angles, regardless of the sun and worry about getting the perfect shot later via VideoPix. 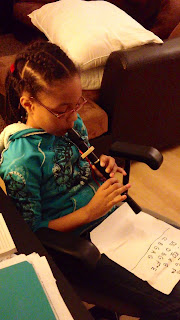 Here is my daughter playing "Happy Birthday" on her Recorder (didn't we call these flutes when we were kids?). I never took pictures of her playing, but rather took a video of her playing. With VideoPix, I could view the video and could chose as many stills as I liked. They even give you the ability to use a few filters. Hope some of these tips help.